1. Put the breadcrumbs in a small frying pan with 1 tbsp olive oil and a pinch of salt. Stir over a medium heat for a few minutes, until golden. In a small bowl, whisk the remaining oil with the lemon juice to make a dressing; season. 2. Put the peas, pea shoots and most of the mint leaves in a mixing bowl and add ¾ of the dressing. 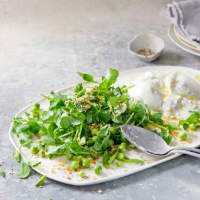 Toss together and arrange on a platter, placing the burrata alongside. Splash with some of the remaining dressing and a grind of black pepper, scatter with extra mint leaves and sprinkle over the crumbs.